When purchasing items purchased from CalPumpShop.com you get a 15 Day Money Back Guarantee. Credits are usually processed within 14 days of receipt of item. Return Policy only applies to retail sales. Wholesale sales have there own policy. All returns must be sent to us at the senders expense. CalPumpShop.com can not incur shipping charges for returned packages. * Returned items must have a Return Authorization Number Clearly noted on the top of the box. Items that do not have this number will be be refused at the senders expense. Orders cannot be cancelled once the checkout process has been completed. Due to our commitment to process orders quickly, once the checkout process is completed our warehouse is immediately notified to pick and pack the order for shipment. We regret any inconvenience that this may cause you. Cancellation requests need to be submitted by e-mail. If there is time to cancel the order there will be a 10% surcharge for doing this as noted in the shopping cart at checkout. Handling Fees are non refundable. 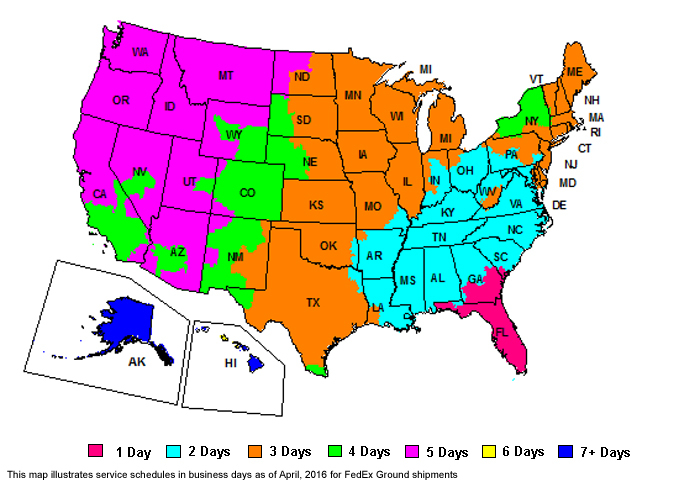 We usually ship via FedEx Services such as FedEx Ground, FedEx Home Delivery, FedEx Express Saver (3 business day), FedEx 2nd Day (2 business day), FedEx Standard Overnight (1 business day by end of day, and FedEx Prority Overnight (1 business day usually by noon - some areas are by end of day if rural). This is calculated based on both weight and dimensions and to the destination zip code. Our shopping cart will figure this cost for you and in most cases is pretty accurate. Our cart is only configured to show UPS options at this time. We will use the same service type from FedEx based on the service chosen. If in doubt you can also call or email us with your zip code and the item(s) that you are looking for and we will be happy to calculate the rate for you. Our cut off time for expedited services is 1 pm E.S.T. Monday - Friday. If you are really in a bind and it is after 1 pm call us and we will try to get your order out the same day. We are happy to ship to these areas by UPS/FedEx Ground, UPS/FedEx 2nd Day and Next Day Air shipping to most areas of Alaska, Hawaii and Puerto Rico. The shopping cart will calculate actual charges through the UPS system. We cannot ship to PO Boxes or APO/AE. For Puerto Rico - Please choose Puerto Rico as your Country at checkout to get an accurate rate. Usually it is best not to choose Next Day Air as we have heard that they still take 2 business days. Transit time to your location is color coded by Days required to reach you from our location.